This morning’s retail sales report for March was very strong on both a nominal basis, up +1.6%, and also on a real, inflation-adjusted basis, up +1.2%. 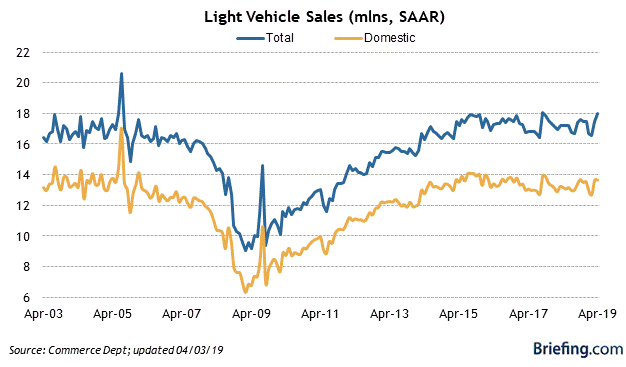 At the same time, it is still ever so slightly below its peak of five months ago, and YoY real sales have not recovered to those typical for this expansion. Let’s take a look. As revised, both of these last made new highs last October. So the good news is, the weakness of the last few months has been entirely reversed. The caution is, we still don’t have a new high, although this data series is notoriously noisy. No big economic releases today, so let me follow up further with a few long-term comments on industrial production. Of those 25 times, 17 have been during recessions, sometimes having started shortly beforehand. On only 8 occasions have negative YoY readings not been associated with recessions. That’s better than a 2:1 rate of correct readings vs. false positives, with no false negatives. But it gets better. If you take out the 4 times industrial production has been negative YoY for only one month — July 1954, July 1967, July 1989, and January 2014 — that’s 17 correct calls and only 4 false positives, a ratio of better than 4:1. Further, I have pointed out that, even when the spread between short and long term bonds simply gets tight, even if there is no outright inversion, employment growth almost always falters. And goods-producing employment – including manufacturing and construction jobs – has *always* faltered in the past 60 years. In other words, even if the Fed stops raising rates now [as of August 2018], and the yield curve does not get tighter or fully invert, my expectation is that monthly employment gains will decline to about half of what they have recently been — i.e., to about 100,000 a month — during the next year or so.